The US government shutdown entered its second week amid calls from Wall Street and US creditors to prevent a default on the federal debt, which would occur unless Congress moves to raise the country’s borrowing limit by October 17. 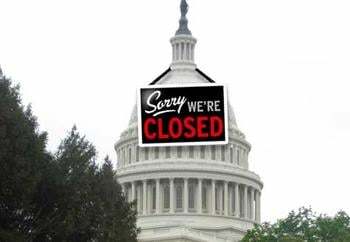 Discussions in Washington are increasingly treating the ongoing government shutdown, which has furloughed hundreds of thousands of workers and shut down social services and other regulatory agencies as a non-issue, stressing instead the need to avoid a debt default. This was underscored over the weekend when the Obama administration ordered the vast majority of Defense Department personnel to return to work despite the shutdown, leaving the full burden on social programs and regulatory agencies. An article in the Washington Post on Monday reported that “the collective impact of a scaled-back shutdown is expected to be small,” with “economists” shifting their alarm to the debt default. Global stocks fell again Monday, as major US creditors, including Japan and China, issued warnings to the US to prevent default on the government’s debts. Zhu Guangyao, China’s vice finance minister, urged Washington to “ensure the safety of the Chinese investments,” while a senior official in Japan’s Ministry of Finance told the Financial Times that Japan is “very worried about the potential impact” of a US default. Democrats and the White House responded to growing concerns within the political establishment over a debt default by proposing “a short-term bill, perhaps lasting only weeks, if necessary to avoid going over the brink,” the Post reported. Such a bill would contain no provisions to end the government shutdown and would set the stage for a broader deal to slash social spending. The Republican-controlled House has passed a number of measures to ameliorate the effects of the government shutdown, including funding for the Food and Drug Administration and the promise to make good on back pay owed to workers as a result of the shutdown. So far the Senate has stalled on all but one of them: a bill to continue paying uniformed military personnell and civilian support staff. A Washington Post-ABC News poll released Monday showed growing popular opposition to the government shutdown, with the approval rating for Congress falling to 11 percent, near its lowest level ever. Seventy percent of the population disapprove of the Republicans’ handling of the budget, up from 63 percent last week. The Republicans, meanwhile, are increasingly shifting their demands from the call to defund or delay the Affordable Care Act (ObamaCare) to attacks on entitlement spending. “Any debt-limit increase is going to require cuts and reforms to address America’s enormous budget deficit,” said Brendan Buck, a spokesman for Republican House Speaker John Boehner, reinforcing remarks that the Speaker had made over the weekend. In an interview Sunday on the ABC News program “This Week,” Republican House Speaker John Boehner told interviewer George Stephanopoulos that the Republicans would make discussions on additional spending cuts the prerequisite for any deal to increase the US government’s debt ceiling. In tying any increase in the debt limit to the demand for entitlement cuts, Boehner is taking up signals by President Obama that he is open to a deal along similar lines. In an interview last week with CNBC, Obama made clear that he is considering cuts to social programs—including Medicare and Social Security—as part of the budget debate. Obama raised these proposals as measures he would support outside of the immediate framework of the current budget discussion. However, behind the scenes, members of Congress are working on proposals that would resolve the debt limit impasse by means of a deal to slash entitlements, which the White House has already agreed in its latest budget proposal. With nine days left before October 17, the day the Treasury says the US will run critically low on cash, Wall Street and US creditors are increasingly demanding that the budget negotiations do not in any way affect the country’s debt payments. Wall Street’s concern over the debt limit, however, in no way contradicts its demands for cuts to Social Security and Medicare, which, though overwhelmingly opposed by the majority of the population, are supported by both the White House and the Republicans.